As things progressed and I started to think about what I would design, my thoughts shot all over the place. Immediately, I thought cables. This yarn just screams cables. And then I thought, it would have to be an accessory, a cowl or tam of some sort. Then, it was a jacket - tweed calls for a jacket, right? Right?! I was slowly losing it, and losing a lot of sleep. Then, I started to inquire and learned about some of the other knitters who would be taking part in this project. I don't think I have ever felt so insecure in my life. I kept thinking that the company I would be in would surely dwarf any attempt at a design I could conjure up. I sketched and swatched and slowly I realized I had to approach this design in a totally different way. I had been used to being inspired by a yarn, or something I had seen on someone on the street. I would just go and grab a yarn from my stash, and swatch away. 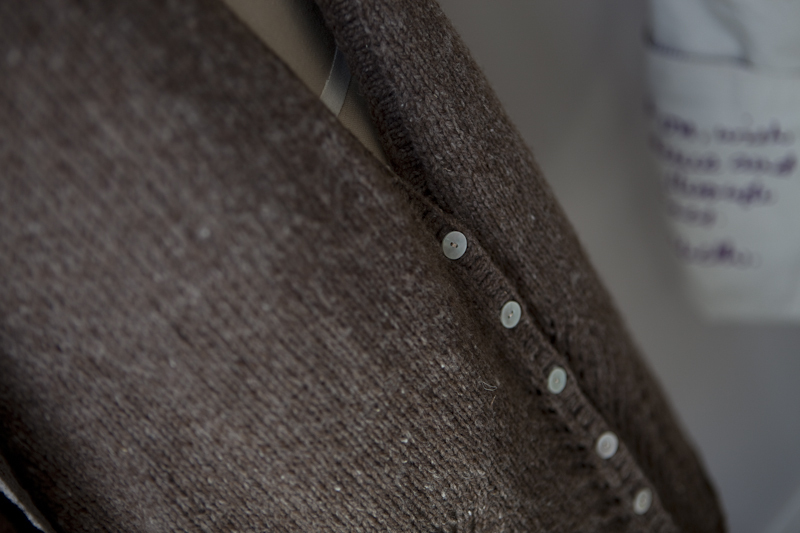 With SHELTER, I was not only representing myself and my thoughts on knitwear, but a company - Brooklyn Tweed. I wanted not only my aesthetic to come through, but also what the company has always stood for, and what the yarn represented. I suppose some artists would think that would be a compromise of their creative integrity. For me, it was a way to focus my creative energy and conversely create outside of my usual box. My boundaries and horizons had to shift. Voila, the Perry Cardigan was born. Since I had immediately thought of cables, I wanted to do something more unexpected, so I went with lace. And since I immediately thought of something thick, dense and substantial, I wanted to make sure it was light and airy - again, something unexpected for this yarn. I really love this cardigan. It's nothing earth-shattering design-wise, but I think it's something that will turn into a favorite - the one you grab to run errands, meet friends on the weekend, or keep in your office to fight off that chill. I hope you like it, and I hope you enjoy knitting it should you choose to. I think I'll have to make one for myself in Sweatshirt - a great SHELTER gray.